What would you do to gain a sixth sense? Some of us would submit to a minor surgical procedure where a magnet is implanted under the skin. While this isn’t the first time magnet implants have been mentioned here on Hackaday, [The Thought Emporium] did a phenomenal job of gathering the scattered data from blogs, forum posts, and personal experimentation into a short video which can be seen after the break. As [The Thought Emporium] explains in more eloquent detail, a magnet under the skin allows the implantee to gain a permanent sense of strong magnetic fields. Implantation in a fingertip is most common because nerve density is high and probing is possible. Ear implants are the next most useful because oscillating magnetic fields can be translated to sound. For some, this is merely a parlor trick. Lifting paper clips and messing with a compass are great fun. Can magnet implants be more than whimsical baubles? The Hackaday Prize has had a few medical devices make the semifinalist cut, and of course wearables are on the list. How about implantables? 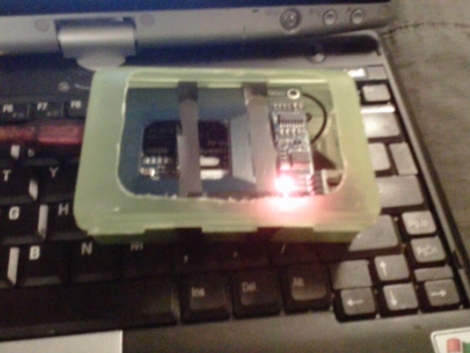 That’s what Bionic Yourself 2.0 (or B10N1C) is doing with an implantable microcontroller, battery, and sensor system. The hardware in B10N1C includes a electromyography sensor for measuring muscle activity, an accelerometer, a vibration motor, RFID reader/writer, temperature sensor, and – get this – a LED bar graph that will shine a light through the skin. That’s something we’ve never seen before, and if you’re becoming a cyborg, it’s a nice feature to have. As with anything you would implant in your body, safety is a prime consideration for Bionic.the Lithium battery can be overcharged (yes, through a wireless charging setup) to 10V without a risk of fire or explosion, can be hit with a hammer, and can even be punctured. The enclosure is medical grade silicone, the contacts are medical grade stainless steel, and there’s a humidity sensor inside that will radio a message saying its time to remove the device if the moisture level in the enclosure increases. Because the device is implanted under the skin, being able to recharge and update the code without a physical connection is the name of the game. There’s a coil for wireless charging, and a lot of work is going into over the air firmware updating. It’s an astonishing project, and while most people probably won’t opt for a cyborg implant, it will look really cool. [Dave] loved his iPod nano so much that he implanted 4 magnets in his arm to hold it. Ok, go ahead and shout “fanboy” at your screen and say something snide about apples products or lament the poor working conditions at foxconn. Got it out of your system? Cool. Actually, if we had to guess, [Dave] really isn’t doing this all for his love of the device or the company. It is much more likely that he is just really into body modding and this was a convenient theme for a mod. We find the idea pretty interesting. We’ve seen implants before, but they are usually of the RFID type. Typically those are used for some kind of security or computer control. Implanting a magnet, however, is interesting because it could almost give you a “sixth sense” You could detect what was magnetic, and how magnetic it was. If we were going to do something like this, we would probably go fully sub-dermal though to help avoid infection. What other kind of implants could you realistically do with today’s technology to give yourself other senses? [Jair2K4] is using his unique RFID tag address as an online password. We’d bet that if you went far enough to get an implant in your hand you’d continually search for a reason to use it. Wanting to do more than just start his car with a wave of the hand, he built an interface module out of an Arduino and a Parallax RFID reader. Using a program called AAC Keys on Windows 7 he emulates a keyboard using the input from the Arduino. When it comes time to login he types his username and parks the cursor in the password box. By holding the RFID implant next the reader, the ID is dumped as the password, along with a newline (might be a carriage return, we’re not certain) character which submits the login. Take a look for yourself after the break. On the one hand, nobody will be able to steal his tag as easily as they could steal one that is on a key ring. But we know RFID is rather notorious for a false sense of security. As long as you’re not using it for state secrets we think it’s a nice solution. Update: After reading the comments on this feature, [Jair2K4] made some changes to his code. It now reads the tag and verifies it with stored data, then spits out whatever password you wish (making it easy to change passwords from time-to-time). He also added servo control to the sketch.